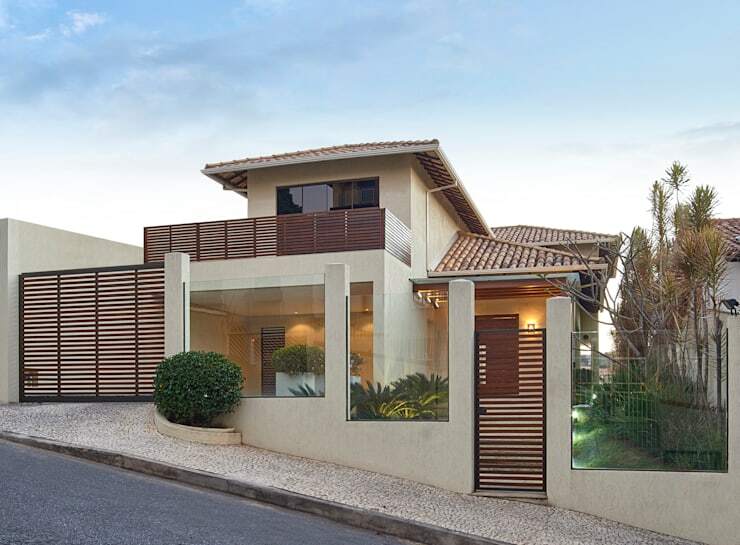 We are in vibrant and lively Brazil today, dying to explore the suburban and stylish Residencia AM, which delights with subtle and modish doses of luxury. 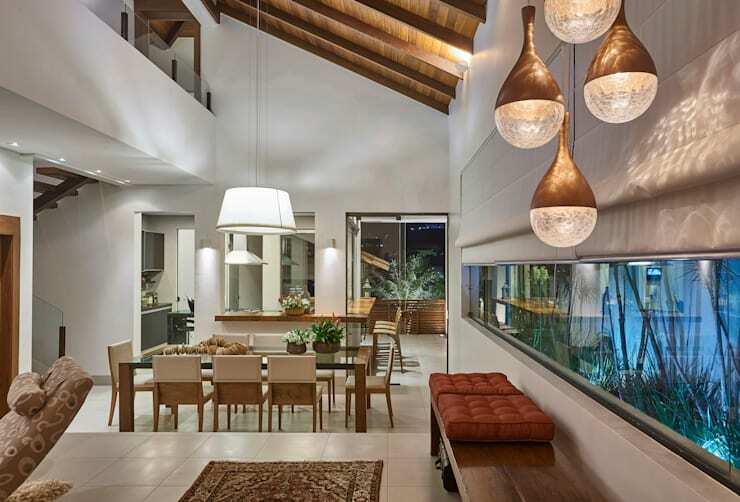 Rendered creatively by the architects at Isabela Canaan Arquitetos E Associados, this large and contemporary home is fitted with interesting materials and textures, cosy accents, sleek designs, charming lights, and oodles of greenery both inside and outside. Warm, neutral tones paired with wood and elegant shades of white rule the abode and render elegant simplicity to the structure as well as the rooms. What we especially love is the unique use of glass which accentuates the best qualities of this home from the word go! As we begin the tour, you will also realise how both aesthetics and functionality have been equally taken care of for a modern and convenient living experience. Simple lines, angles and slants seem to define the architecture of this property, but with a dash of uniqueness. Creamy white walls have been aptly contrasted by country style roofs lined with red shingles. And the large terrace on the top storey catches attention with its slatted dark timber balustrade. The same slats make their appearance for the garage gate and the entrance gate, while clear but toughened glass panels punctuate the boundary wall for ultramodern pizzazz. These panels contribute to a feeling of welcoming openness without compromising on security, and also allow you to admire the lush green landscaped garden peeking from inside. 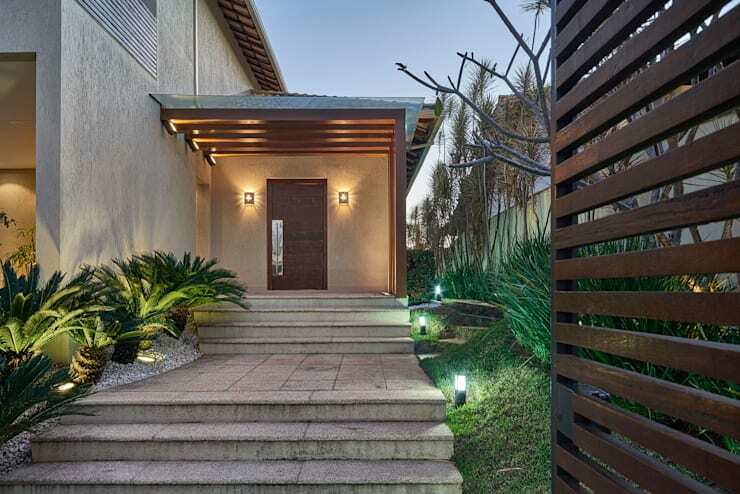 Organic liveliness in the form of verdant plants and bushes flank the neat concrete stairs leading to the solid and smart wooden door. Chic sconce lights add a welcoming glow along with the timber beams on the ceiling, while cleverly arranged ground lights make the approach path safe after dark. 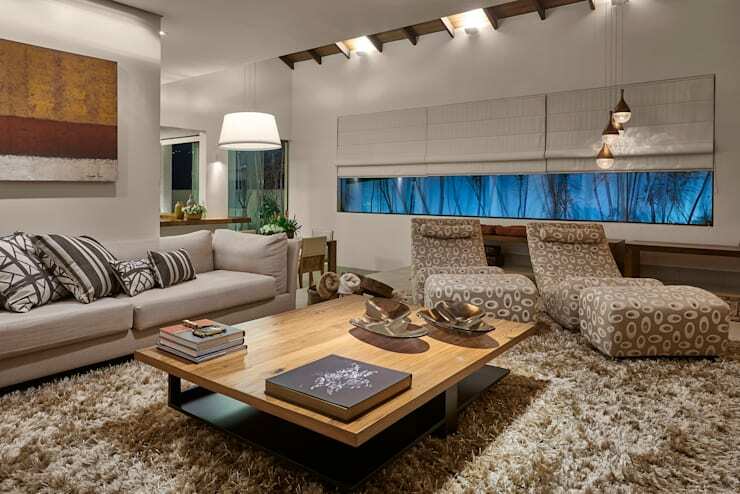 Earthy tones dominate the spacious and lavish living space, with its simple grey couch, plush recliners and ottomans. The carpet invites you to sink your feet in its warm and cozy depth, while the sleek wooden coffee table acts as a stylish and practical addition. Patterned cushions, a couple of books, some quirky artefacts on the table and a fashionable trio of pendant lights ensure the inviting feel of this area. Last but not the least, the long window allows you to admire the beauty of the outdoor greenery. The dining area is at a slightly lower level than the living space and celebrates the open and expansive ambiance of the house. Beyond it, large glass doors and windows help to integrate the kitchen with the open plan layout too. A sleek glass-topped table surrounded by timber and beige chairs cater to dining needs, while potted greens contribute to the cosy atmosphere. The simple but elegant pendant lights cast a soothing glow over the setting, while the slanted wooden ceiling with its beams adds a hint of rustic charm to the space. 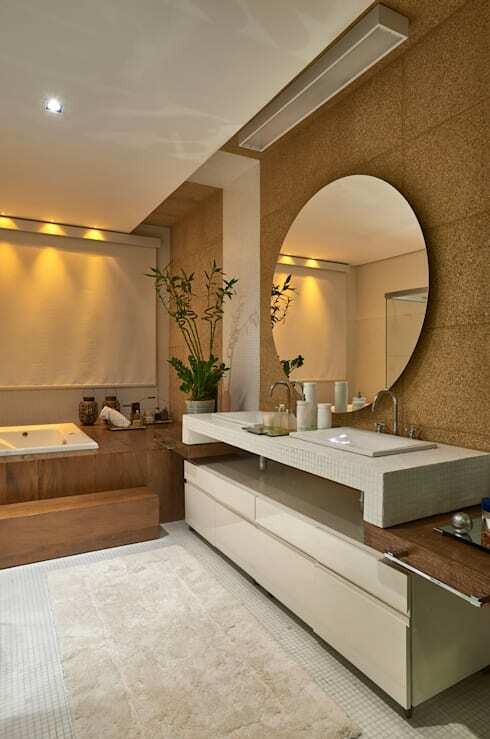 Wooden accents and earthy tones couple with elegant white shades to create a spa-like bathroom which seems like a rejuvenation getaway. Warm and serene lights, fashionable fixtures, a sleek gleaming under-sink cabinet and a round mirror add to the magic of this space. And a plush white floor mat, bottles of lotions and potions, and a refreshing potted green take care of the cosiness factor here. 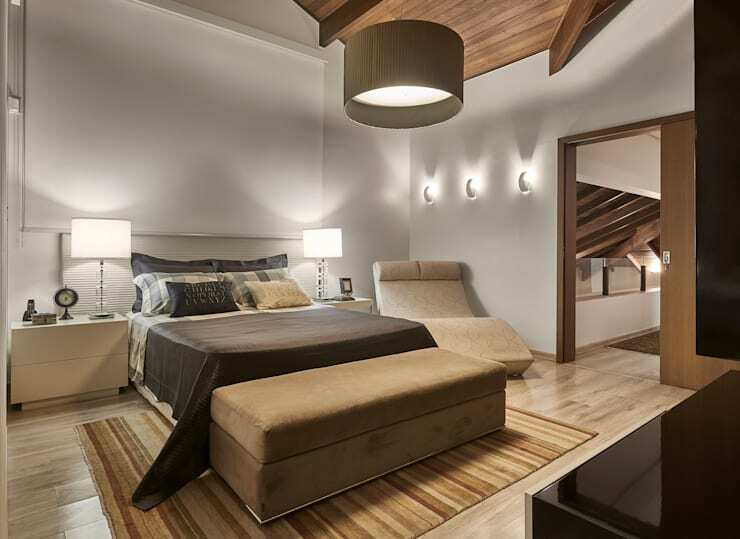 Varying shades of brown, beige, white and wood dominate the simple but elegant bedroom. The plush bed enjoys the company of a stylish recliner and a cushioned bench at the foot end for additional comfort, while compact night stands hold trendy lamps for a romantic setting. The chocolate brown pendant lamp is a chic addition, while the wooden glow of the floor and ceiling softens the starkness of white walls effectively. The striped rug is oozing with earthiness too and promises understated luxury in a contemporary form. 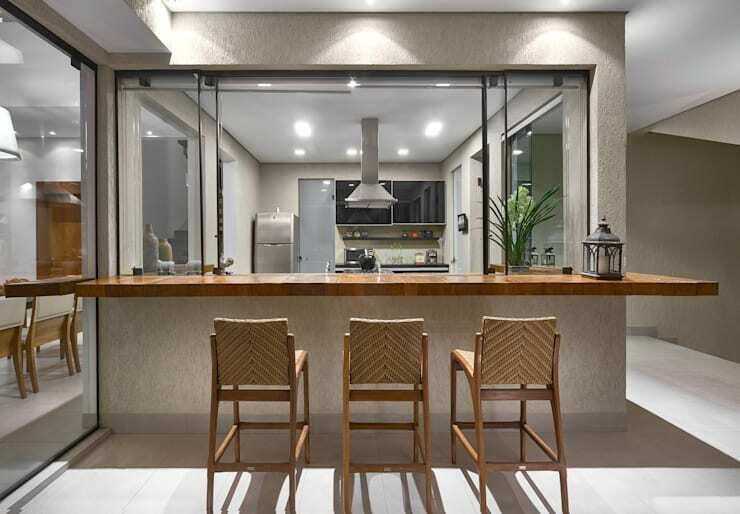 We love how the kitchen has been fitted with sliding glass doors in sleek frames, which enhance the home’s openness whether they are open or shut. The spacious, modular kitchen leads to a slim wood-topped bar counter under stylish lights, where you can enjoy refreshing drinks while chatting with the chef. This nook also serves as a smart spot to relish breakfast or grab a quick bite during a busy schedule. Tasteful furnishing, smart and open layout, clever incorporation of greens, and warm wooden touches make this residence a pretty and comfy place to live in the suburbs. Here’s another tour though if you want more inspiration - This Dreamy Apartment Is Downright Brilliant.